You already have a big collection of LEGOs, but your kid really wants a new set he saw at the toy store that will help him build a car. Now what? New website Rebrickable helps you repurpose all of the LEGO sets you already have to build the structures and vehicles of sets you’ve never bought, and likely don’t have to. Chances are, your kid can build a pretty cool car with the bricks he has. To get instructions for new projects simply input the serial numbers of all of the sets you have, indicate whether or not you want the colors to match exactly, and if you’re looking for a specific set. 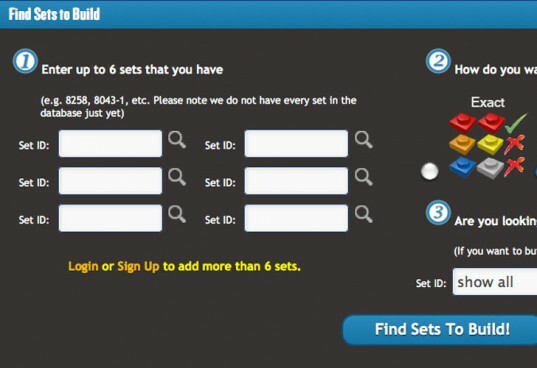 Thanks to an extensive database, Rebrickable will deliver results of all of the other sets you can build (or closely build) with what you have, along with a list of any pieces you’re missing for an exact match. LEGOs are certainly an open-ended toy and they last pretty much forever. In fact, your kids may even play with your old LEGOs, hand-me-down sets, or garage sale LEGO finds. But despite the fact that kids could play with the same LEGOs for years, there’s always an extra element of fun when they get a new set and instructions to build something fresh and cool. So by showing you how to combine your LEGOs to create other sets, Rebrickable is a brilliant way to help old LEGO bricks feel new and exciting again. If your child has more fun building with LEGOs from scratch, making her own creations rather than following included instructions, she can share a custom MOC (my own creation) on the site. And if your child likes following the instructions best, the searchable list of MOCs and other closely matching sets will keep him happy and busy. The site also appeals to the LEGO collectors and enthusiasts who’ll be able to experiment with building rare sets that may no longer be available. Rebrickable appeals to our geeky side by offer LEGO statistics about the sets in the database, most popular LEGO parts, average number of bricks per set and more. You already have a big collection of LEGOs, but your kid really wants a new set he saw at the toy store that will help him build a car. Now what? New website Rebrickable helps you repurpose all of the LEGO sets you already have to build the structures and vehicles of sets you've never bought, and likely don't have to. Chances are, your kid can build a pretty cool car with the bricks he has. To get instructions for new projects simply input the serial numbers of all of the sets you have, indicate whether or not you want the colors to match exactly, and if you're looking for a specific set. 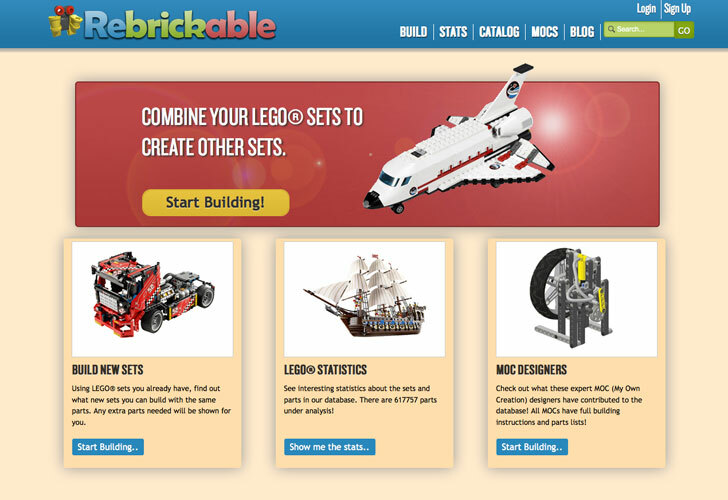 Thanks to an extensive database, Rebrickable will deliver results of all of the other sets you can build (or closely build) with what you have, along with a list of any pieces you're missing for an exact match.